The graphic below displays the market share of each PHP version as on march 2008. The blue graph represents the sum of all preceding versions. PHP 5.2.5 now is the most popular version of PHP followed closely by PHP 4.4.8 and 4.4.7. This information can be helpful if you are planning on creating an Open source project or are thinking of moving past the version 4 mark in your professional career but are hesitant regarding the version 5 support on servers. 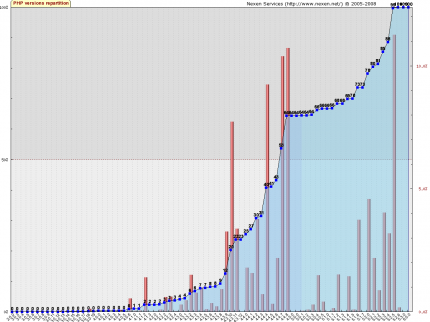 The below two graphs show the market share of various PHP versions for April 2007 and April 2008. As you can see PHP version 5 has reached a market share of 36% from last years 17%, more then double in one year. As PHP version 6.0.0 is nearing the release date, you can expect PHP 5 to hopefully cross the 50% market share by this year end. I’am very keen on knowing if any of you are planning on migrating to version 6 after release or have decided to wait a year or year-an-half prior to adoption. Most of the people I know, still stuck with version 4.x.x, have decided to move to PHP 6 directly rather then go through the 5.x.x route. The data for this analysis was collected by Nexen from 28 million servers and you can find a more detailed analysis on their site. I don’t believe this, because a good amount of people are using debian and ubuntu both are still at 5,2,1 in stable mode(because you never want to use testing on a production server). Hopefully, GoPHP5 will raise the number of people using PHP 5. The problem isn’t people, it’s web hosts running ancient machines, and their refusal (or inability) to upgrade.